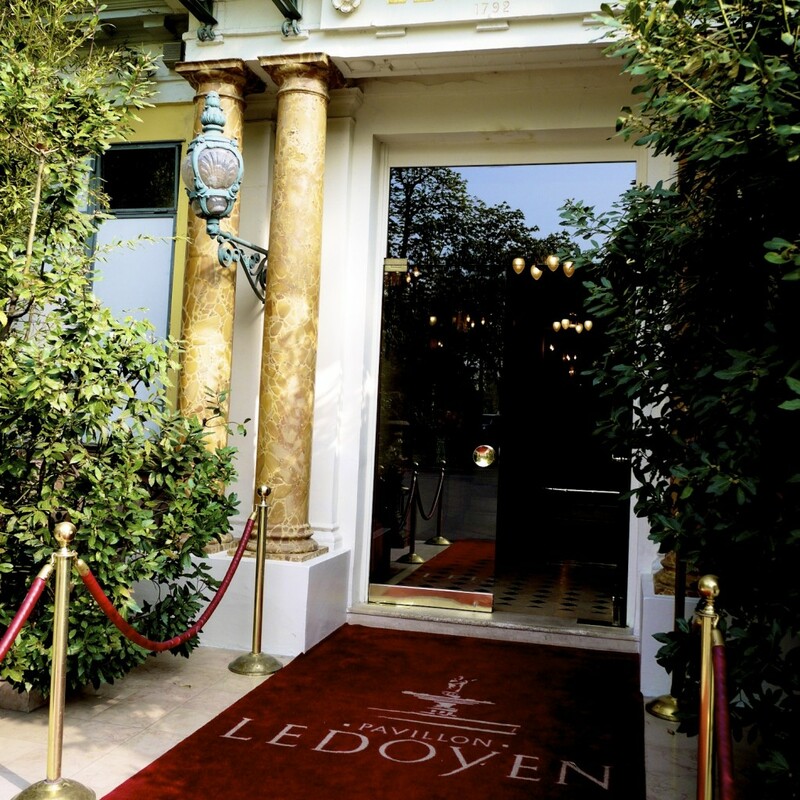 Ledoyen is one of Paris’ oldest restaurants situated in the quiet gardens off the Champs Elysées. The restaurant dates as far back as 1779 when it operated as an inn in the outskirt of Paris before it transformed into a restaurant under Pierre-Michel Ledoyen twelve years later. 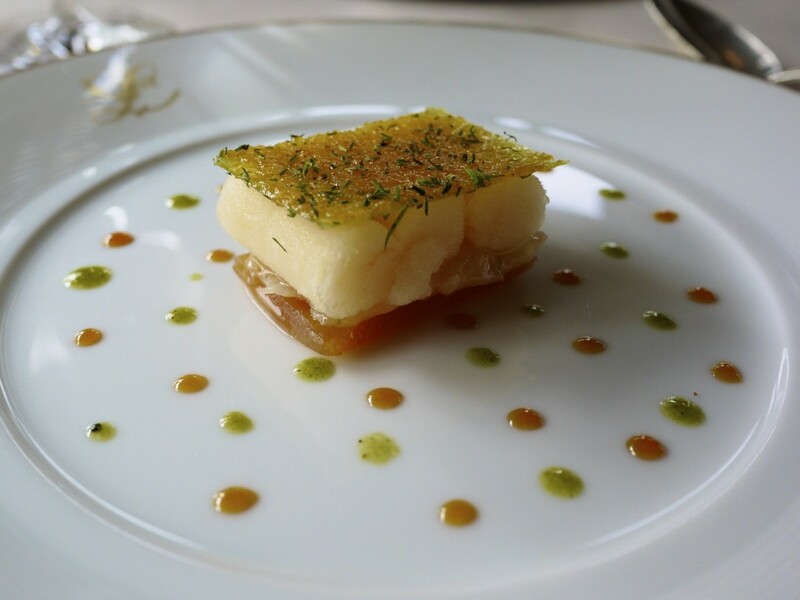 As one of Paris’ oldest restaurant it has catered for some high profile individuals including Monet, Picasso, Cezanne, Degas and Flaubert, and was reportedly where Napoleon and Joséphine first met. As a restaurant that has been far more secretive about their success, I was very curious to try Head Chef Christian LeSquer’s cooking. 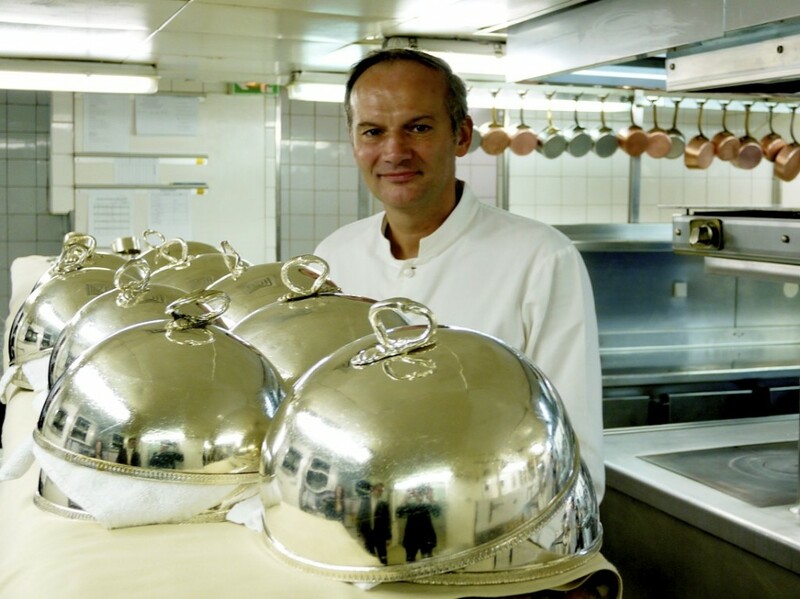 After all, he was instrumental in gaining the third Michelin star after joining the restaurant in 2002. The neoclassical influenced two storey building, which extended to the interior, evidenced by the luxurious and elegant curtain and coordinating wall papers. This must be one of the most majestic dining space in Paris and surprisingly very comfortable too from the generously large tables to the plush armchairs. All three sides of the dining room looked out on the tranquil garden and almost made you forget you were in the middle of a large city. 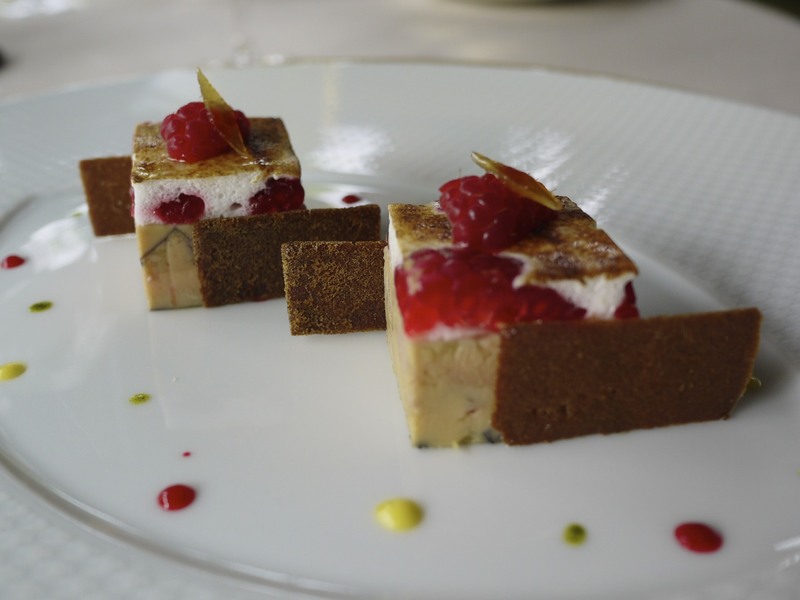 Unlike many of the other three Michelin starred establishments in Paris, Ledoyen also has an amazing offer during the weekday for lunch. For only 128 euros you can get an amazing three-course meal, which also includes a few tasty surprises before, between and after the courses. What’s more, cheese is a given and not even considered to be a course. Bargain! I noticed the Maitre’D conversing in Japanese with the diners sitting next to us before coming to take our order in fluent English. Very impressive given we were in Paris where the language of fine dining is dictated by French. 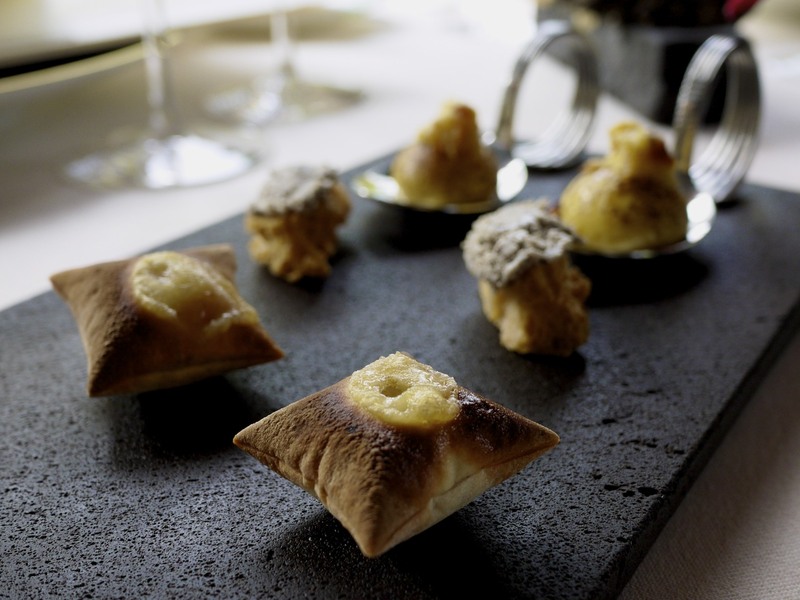 Some nibbles to kick off starting with a parcel that was filled with a delicious and aromatically inviting white truffle velouté, followed by a savoury pastry dusted with an intense mushroom powder and finishing with an onion and leek pastry served on a spoon. 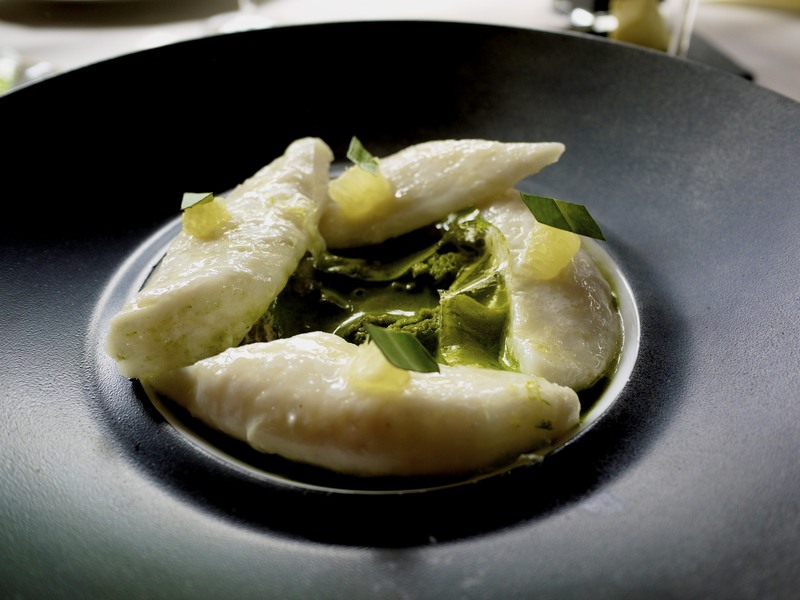 Classic flavours with a modern presentation; what a lovely surprise! 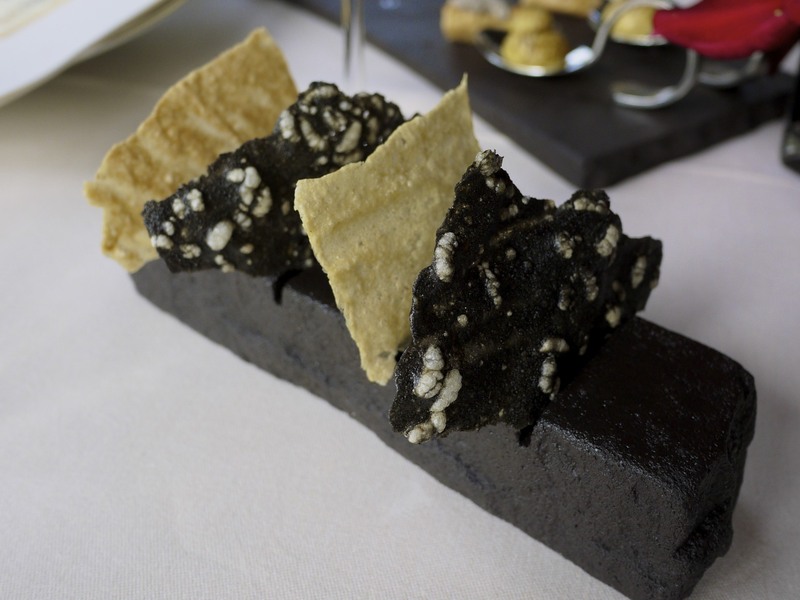 A variety of horseradish and squid ink crackers to go with our glass of Duval Leroy, Femme de Champagne, 2000. 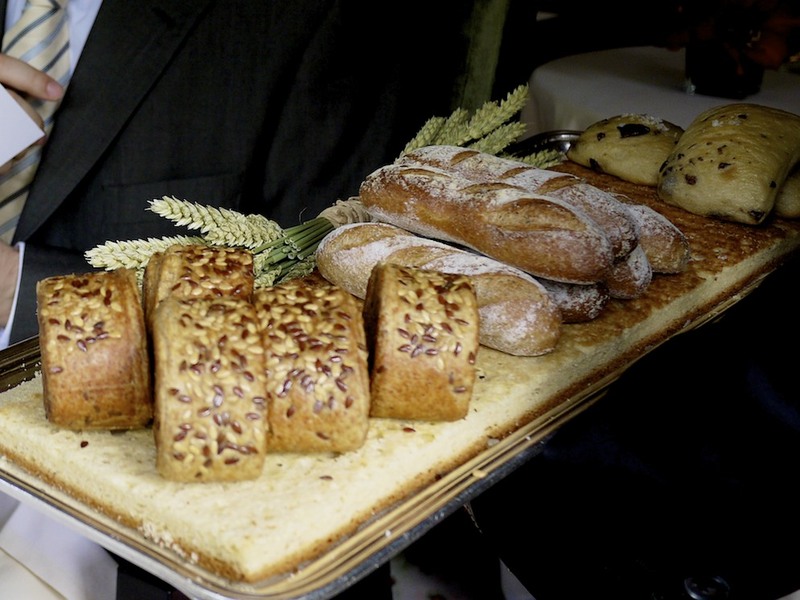 A choice of three bread starting with a sesame roll that had a texture and moisture of a buttery brioche, a crusty and flavoursome baguette and finally a light flavoured olive oil bread. Suffice to say, the French take their bread very seriously and this was no exception. 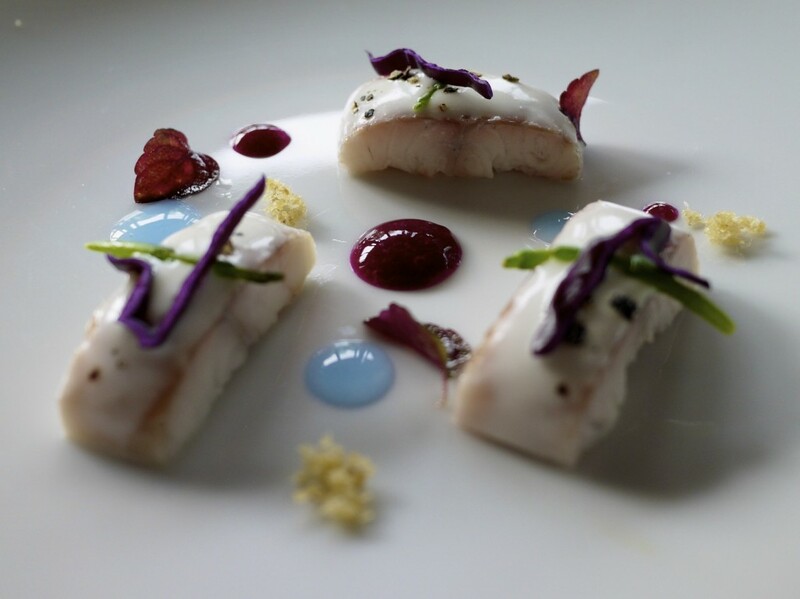 Just when we thought our first course was being served, our waiter surprised us with one final mise en bouche of the smoked eel accompanied with a blue and red concentrated cabbage jus. The eel was handled very delicately and had a good amount of smokiness to it. A great balance of acidity from the red cabbage jus as well. Thoroughly impressive stuff and we had not even had our starter! Foie Gras des Landes au vin de Médoc, Meringue citron / framboise. 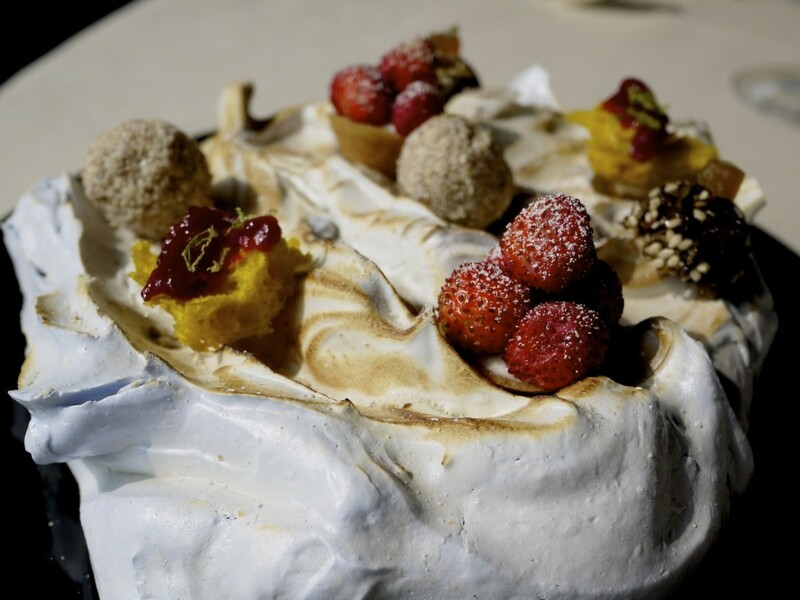 A very elegant dish combining a base made from rich foie gras that had been poached in red wine with a layer of a lemon and raspberry meringue sitting on top with a caramelised surface, finished with a thin crisp for textural variation. The sweetness and acidity from the meringue was just superb to cut through the foie gras, making this a very light starter. Possibly the best foie gras dish I’ve ever had to date. We all have one of those bad decisions we would regret for a long time and the Aiguillette de Saint-Pierre à l’infusion d’Estragon was it. It was basically John Dory cooked in a water bath, served over a bed of lemon and tarragon cream and topped with some grapefruit pulps. Don’t get me wrong. It was not a bad dish but did not come close to my wife’s…. … Pièce de boeuf “Hereford”, sauce ketchup. To put it simply, this was possibly the best cut of steak I have ever had outside Japan and the benchmark against which I now compare all meat dishes. A beautiful sirloin sourced from the high sought-after breed of Hereford. It had all the hallmarks of an amazing steak – juicy, soft and bags of flavour – and hardly needed anything else, including the bastardised “le ketchup” sauce. Mind you, the olive tapenade encrusted bone marrow and blown potato crisps were delicious in their own right. 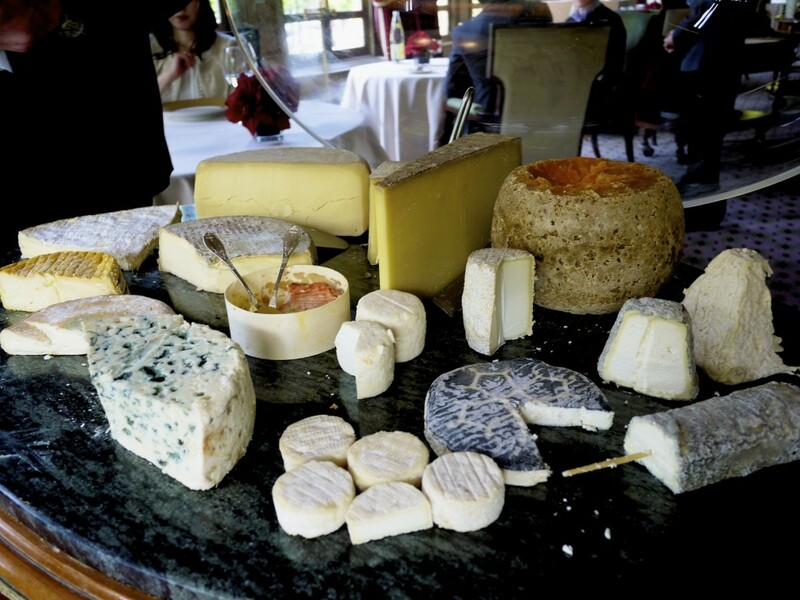 And of course, when in France, one must do what a French man does, eat cheese! Superb selection from the Fromages frais et affinés (fancy way of saying fresh and matured cheese), sourced from none other than the masters of cheese, Bernard Antony and Quatre Hommes. Did I also forget to mention that the cheese course was included in the three-course option? Amazing. Some pre-dessert nibbles to prepare our palate served on a giant meringue. A very fruity and sweet wild strawberry tart, an airy and crunchy orange brioche with raspberry jam, a ball of black and white sesame seeds and ginger, and a basil and almond crème brûlée ball. Our meal got even better when LeSquer decided to make a special appearance and prepare specially for us a bonus course of the their signature dish, Croquant de Pamplemousse cuit et cru. A celebration of grapefruit prepared in five ways starting from the bottom with a layer of sweet confit grapefruit, grapefruit marinated in lime for that lovely citrus flavour and acidity, a refreshingly cool layer of grapefruit sorbet, a grapefruit croquant and finally grapefruit marmalade dotted across the dish. It was refreshing, cool and surprisingly well balanced as I expected the dish to be very tart. It definitely overshadowed our subsequent dessert dishes. I opted for the Fraisier Contemporin which was, surprise surprise, all about strawberries. 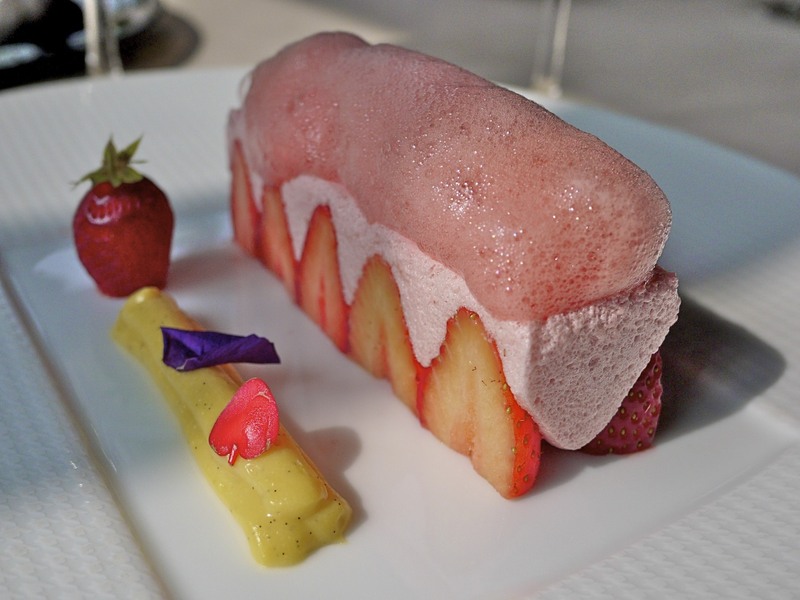 The naturally sweet strawberries formed the base and was also used to make the cream and foam. There was a cold layer of vanilla custard inside and some extra servings on the side just in case you wanted a bit more. Contrary to our expectation, it was a delicate course with a light flavour of strawberries despite the overwhelming pink. A contemporary take on strawberry and cream. The other option was the Rémoulade printanière de carottes aux épices (a spring remoulade from spiced carrots). A couple of slices of fresh orange and cream formed the based to be crowned with shavings of carrot, a carrot sponge cake and some sugar work incorporating concentrated carrot juice. Beautiful vivid colours and a work of art, but more importantly it worked well. 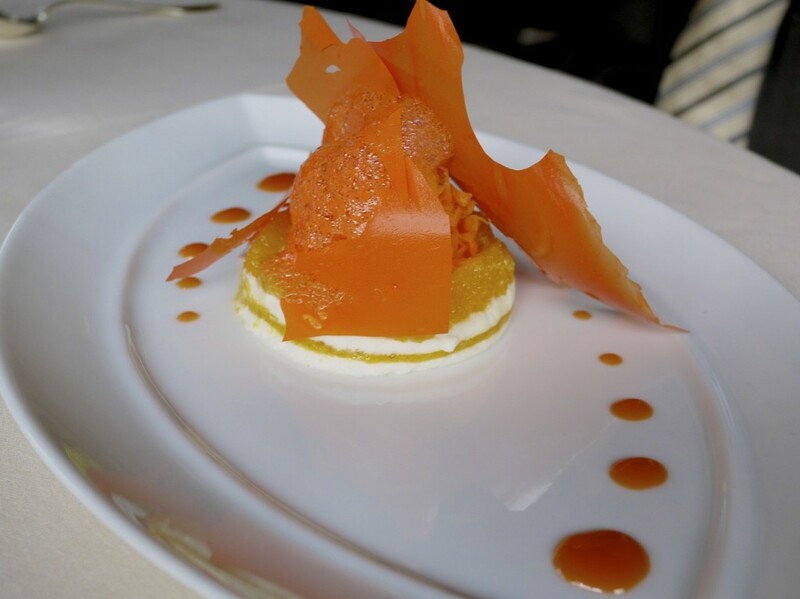 The carrot gave the depth and body to the sweet and refreshing flavours of the orange. 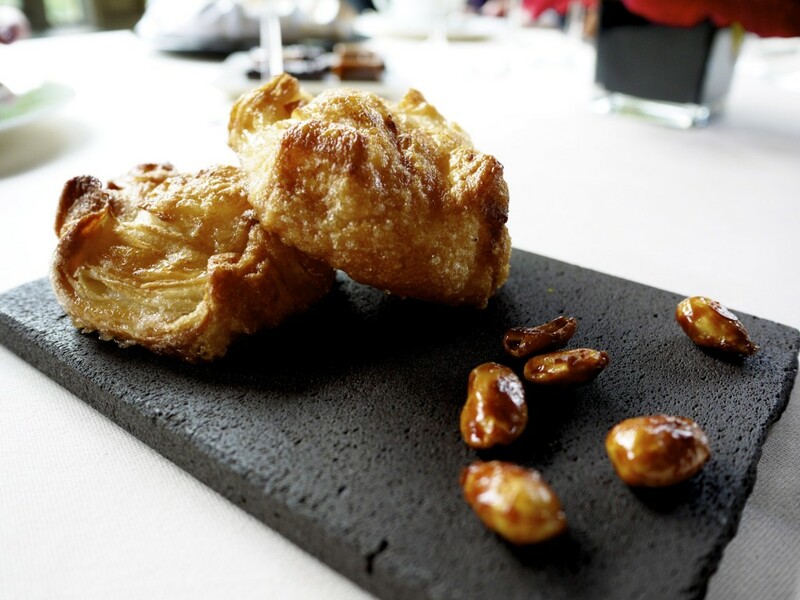 Just in case dessert wasn’t enough, we were also presented with some Kouign-amann avec noisette caramelisee. A traditional cake from Brittany made with bread dough containing a generous portion of butter and sugar folded in and baked slowly, served with caramelised nuts. This was like a croissant on steroid; it was much thicker and much sweeter. Delicieux! 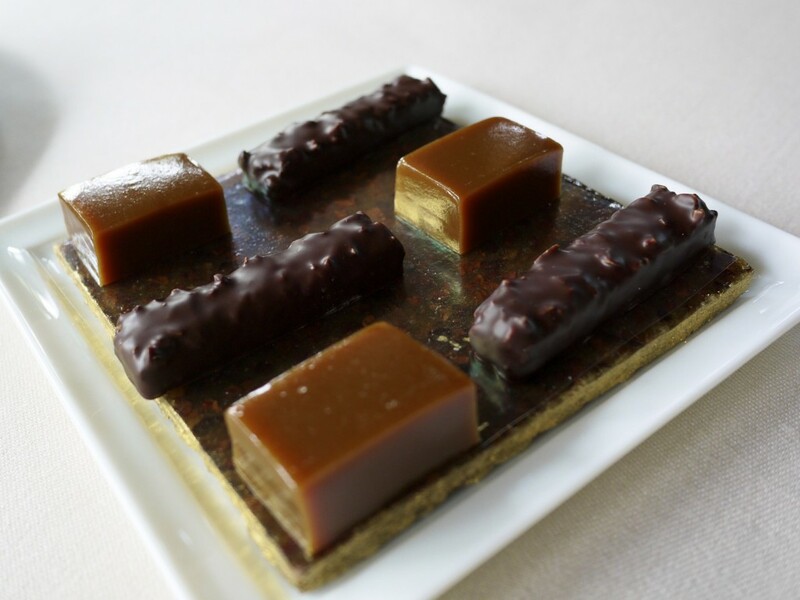 Some caramel and chocolate mignardises to go with our coffee. We were absolutely stuffed! 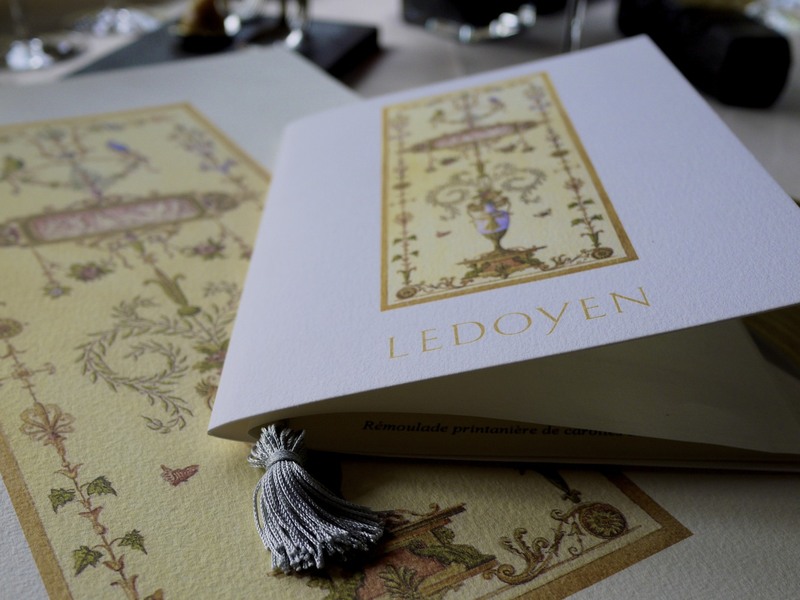 From our discussion with LeSquer at the end of our meal it became apparent as to why there was so little publicity for Ledoyen; after all the website only contained a number and address. He wanted people like us to come with a sense of curiosity, not knowing what to expect. We came, we ate, and we left enchanted. From a first class front of house and comfortable dining space to a flawlessly executed meal at a bargain price, Ledoyen for me was far more enjoyable than Guy Savoy or Epicure. 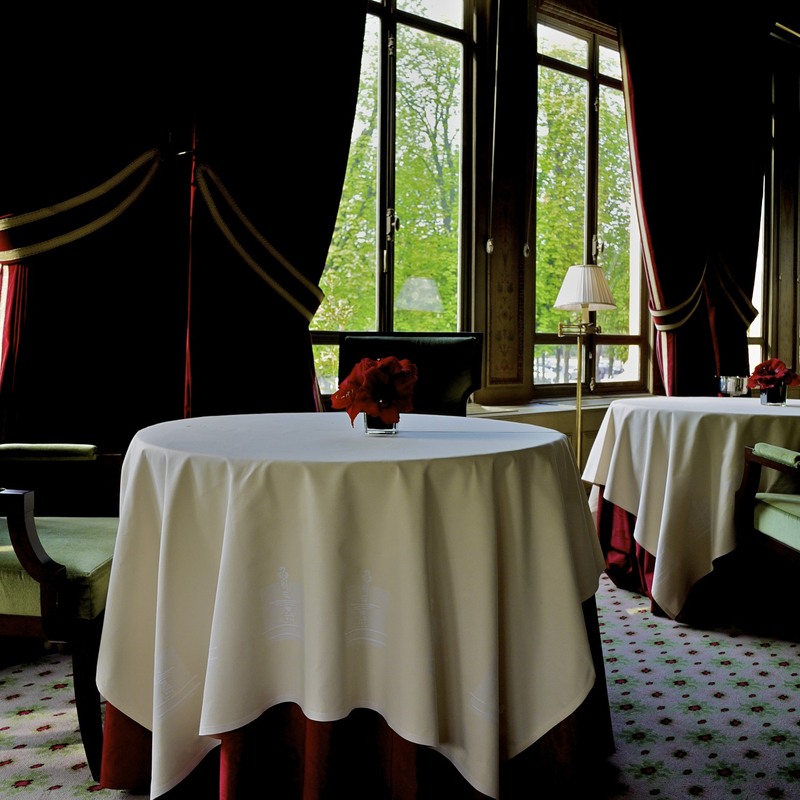 If you truly want an unforgettable experience in Paris, just follow the steps of Napoleon. You won’t regret it. 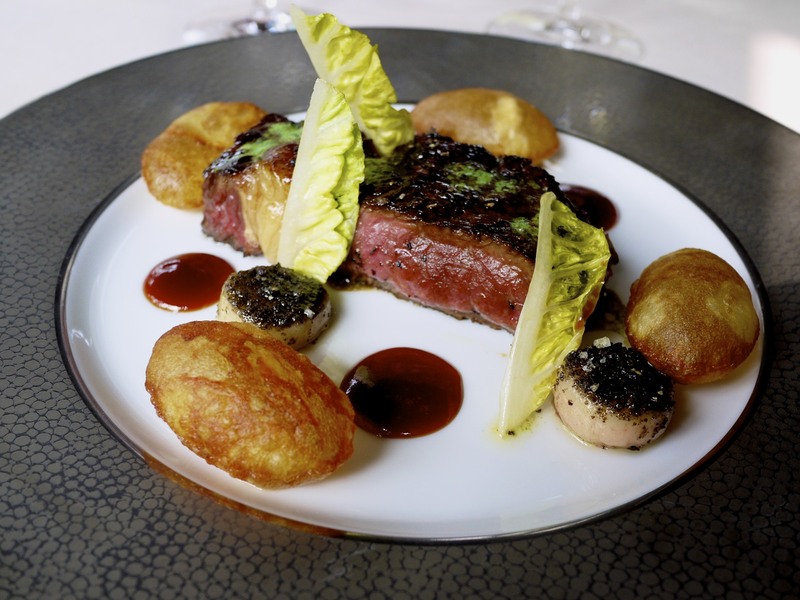 This entry was posted in Europe, France and tagged Champs Elysees, Christian LeSquer, France, Hereford beef, Ledoyen, Michelin, Paris, Three stars on June 8, 2014 by admin.